To a large extent, commercial publishing is a numbers game. When a book includes the words “fly fishing” in the title (as opposed to “bass fishing” or “Kardashian”), expectations are immediately ratcheted back, as there’s only an estimated one to three million fly fishers in the United States. Allude to salt water fly fishing in the title, and your market is chopped more than half again, as a majority of fly anglers have never wetted a line in the salt, and may be only vaguely familiar with the notion. Add the name of a small Central American country to the title – a place that more than a few will situate somewhere in the South Pacific or the Balkans – and you may not have the makings of a bestseller. 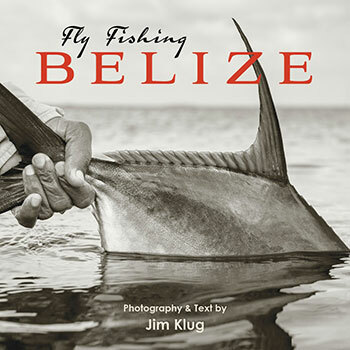 Jim Klug – co-owner of Yellow Dog Fly Fishing Outfitters, co-creator of Confluence Films (Rise, Drift, Waypoints, Connect) and accomplished photographer – has long fostered a love affair with Belize, its people and its fish. (While I have never asked him this question point blank, my guess is that if Klug were allotted only one more day of fishing, he would choose to hunt permit on the pancake flats out of Punta Gorda with one of the Garbutt brothers – or perhaps all of them – at his side.) The book is ambitious in its scope – it provides a primer on Belize, the history of fly fishing here, and an overview of key species (bonefish, permit, tarpon) and their habitat (penned by Dr. Aaron Adams of Bonefish & Tarpon Trust). It then goes on to highlight Belize’s eight most storied fishing destinations – the ones you know (Ambergris Caye, Turneffe Atoll) and ones you may not (Dangriga, Glover’s Atoll). The chapters are punctuated by reminiscences offered by a host of angling luminaries – Lefty Kreh, Craig Mathews, Steve Abel and Brian O’Keefe and others. Though he’s written more than his share of catalog copy for Yellow Dog over the years and is certainly a competent wordsmith, Klug’s real gift – and I daresay, his passion – is photography. This shines through in Fly Fishing Belize; some of the flats shots are simply amazing (what lense did he use to get those bonefish SO CLEAR below the surface? ), but the incidental images – a street scene in San Pedro or a “Watch for Manatee” sign in Belize City – do even more to convey a sense of being there. After flipping through, you’ll want to begin booking your next trip…and I imagine Jim’s cohorts at Yellow Dog will be standing ready to help you on your way.